Good condition. One of the keys (as pictured) is a bit off. It still works it's just bent up a little so it tilts up. Dell Precision M6700. Model Number: LITEONIT LCS-256M6S 2.5 7mm 256GB. 256 GB SSD. Model Number Precision M6700Search for Similar. Display Size 17 LCD with 1920x1080 resolution. System Ram 16 GB Ram ( 4 Total Slots with 4 slots filled). NVIDIA Qadro K3100M. 500GB SSHD X 2 HARD DRIVE. 500GB 500GB SSHD = 1TB TOTAL. DELL PRECISION M6800 LAPTOP. Dell Precision M6800. 4th Generation Core i7. Windows 10 Professional (64bit) And Office 2016 Installed. Up for sale is a Dell Precision M6800 laptop. This fully-loaded machine has been fully tested, and is ready to use. It is running a clean installation of Windows 7 Professional. It will be ready to go out of the box! 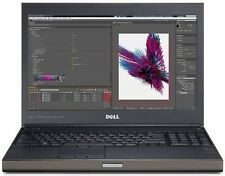 PC DELL notebook Precision M6800. (081) PC DELL notebook Precision M6800. PROCESSORE: Core i7 4800MQ 2.70 GHz. Core i7 4800MQ 2.70 GHz. HARD DISK: 480 GB SSD. 480 GB SSD. RAM: 16 GB. SISTEMA OPERATIVO: Windows 10 pro. NVIDIA Qadro K3100M. 500GB SSHD X 2 HARD DRIVE. 500GB 500GB SSHD = 1TB TOTAL. 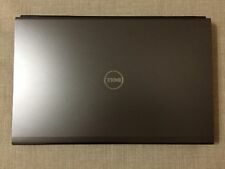 DELL PRECISION M6800 LAPTOP. Dell Precision M6800. 4th Generation Core i7. Windows 7 Professional (64bit) And Office 2007 Installed. PC DELL notebook Precision M6800. (081) PC DELL notebook Precision M6800. PROCESSORE: Core i7 4800MQ 2.70 GHz. Core i7 4800MQ 2.70 GHz. HARD DISK: 480 GB SSD. 480 GB SSD. SISTEMA OPERATIVO: Windows 10 pro. With this processor, you are well endowed, if you have to much. The refurbished Dell Precision M6800 is equipped with a 128 GB SSD storage. A nVidia Quadro K3100M 4.0 GB graphics card provides a good graphics performance and performance.